When PR samples arrive for basic ingredients it's always fun. No one is going to send out something simple that they believe isn't pretty much the best out there. 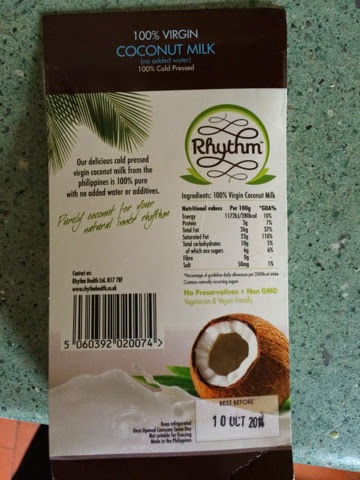 In this case we have Rhythm Coconut Milk - 100% coconut milk with nothing else added. 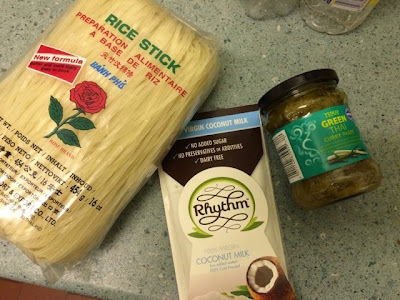 As I love making vegetarian Thai food (the sauce jars contain fish so can't be used) this was something I accepted immediately and cooked on the day it arrived. I used Tesco Thai curry paste and some lovely thin rice noodles to go with it. Here is the nutritional info for those that request such things. It's important to note that my usual brand is canned and certainly not fresh. This means refrigeration is required and I have to use the second pack within the next week. 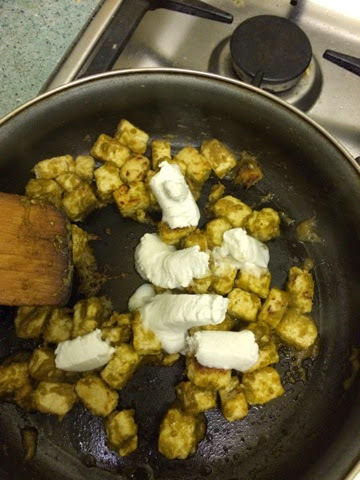 Adding the milk to the already curry paste coated fried Quorn (for maximum veggie credentials and only one day late for National Vegetarian day) was fun as it came out like a textured paste. It got me thinking as to what puddings I could do with this. There are bound to be recipes online that I can find later, but typing this on the iPad on the bus makes that hard! 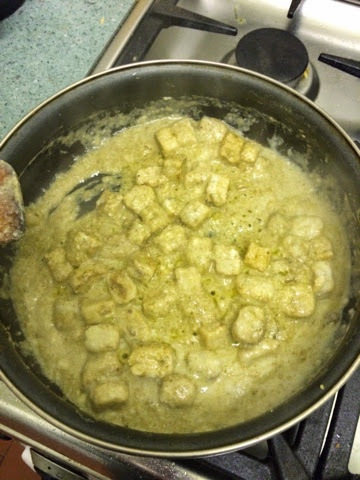 The heat breaks the coconut milk down and blends it nicely into the curry. It didn't completely loose it's texture though, and there was a lovely creamy version of the curry smell filling the kitchen by this point. I went a bit overboard with the curry paste to balance out the large packet and ended up making it a little stronger than usual but it was still incredibly flavourful. This way of making it was much closer to the richness of a restaurant meal. I think with a few more tweaks and additions this could become quite a dish. I forgot to keep a little of the milk separate to make a white swirl in the finished sauce for effect too. If I see this in the shops I'd certainty pick one up as I do make Thai curry often enough to justify it. It's probably still keep a tin of the other stuff in the cupboard for emergencies. Now to try the other pack with red Thai curry!